Cheech Marin has joined the cast of Robert Di Nero's new film, The War with Grandpa. "Tim Hill is set to direct the adaptation of Robert Kimmel Smith’s 1984 novel, which follows a young boy who loves his grandpa Ed (De Niro). But when his grandfather’s wife dies, he has to move in with his grandson and takes his room — much to the youngster’s dismay, who plots a series of pranks to drive him out." Cheech will portray Ed's friend. Sounds like a really corny movie. I wonder what Great Dane tastes like. Last week, Steve Bloom (Celeb Stoner) interviewed Tommy Chong at ICBC Berlin 2017 in Berlin, Germany. 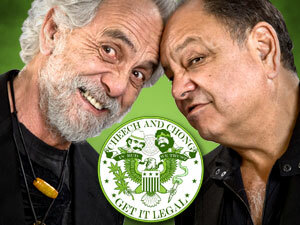 We typically see are a couple sentences in newspapers where Cheech and Chong are promoting their upcoming gig. This is the first time I've seen a long-form format with Tommy Chong in which his responses weren't one-liners from his stand-up routine. At one point, Steve plays Tommy the song he co-wrote while he was in Bobby Taylor and the Vancouvers...Does Your Mama Know About Me? Tommy looks so proud taking a trip down memory lane. Steve Bloom didn't ask any hard/controversial questions, but this probably wasn't the appropriate forum. For instance, Steve should have pressed Tommy for the real story behind the sketch Dave's Not Here. Other than that, this interview is excellent.